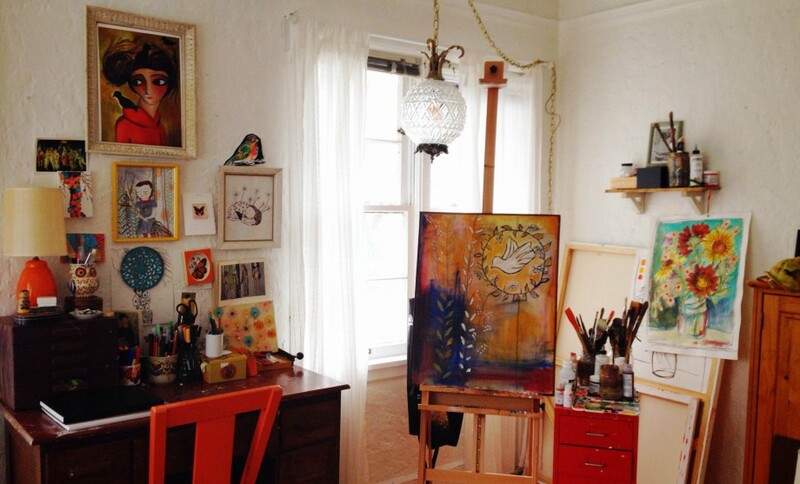 Melinda Santora, a native to The Pacific Northwest, is a self-taught contemporary artist. Working primarily with acrylic, her mixed media works combine vivid colors and organic textures with figurative subjects reminiscent of modernist works of the early 1900’s. She has studied both contemporary and classic art at Southern Oregon University, graduated from The Evergreen State College with an interdisciplinary liberal arts degree, and is an alumni of The Studio Arts Centers International (SACI) in Florence, Italy. The conceptual basis of her current work took root while studying cultural and art history at Evergreen and encountering the paintings of Pierre Bonnard – the striking use of color and patterns combined with intimate figurative subjects – wanting to bring this same juxtaposition together with the patterns of everyday life and elements our natural environment is the foundation of her artistic inspiration. Drawing on the natural world and contemporary social issues of identity and place, her paintings aim to establish an exchange between viewers and the larger universe around them through the sometimes-deliberate-but-often-unexpected pairing between found flora and whimsical feminine archetypes, luring the viewer into discovering an object’s beauty in relation to its surroundings – whether it be the soft red light of a cheek or the incandescence of a fallen seed pod – the observer is drawn into curious introspection, to see what has always existed around them, now viewed in a new light. In the last three years, Melinda has been showcasing her work. Highlights from past showings include the group show, Minimal to Manic at The Match Gallery, during which, her piece ‘Dwell’ was sold to a private buyer. The Pink Show hosted by Splendorporium, featured five of her works: Metamorphosis, Wildflower, Enchantment, Orpheus and Eurydice, and Flowering Flurry of Spring – which was chosen to represent the exhibit for press releases and announcements. And a featured spot in the local Portland Willamette Week Newspaper.